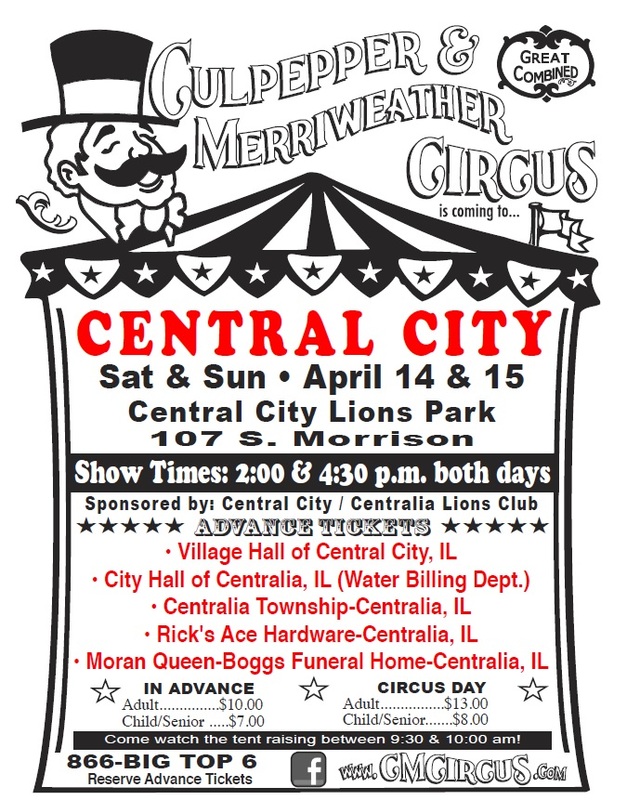 Thanks to the sponsorship of the Central City/Centralia Lions Club, Culpepper & Merriweather Circus, America’s Favorite Big Top Circus is coming to Central City, IL on Saturday and Sunday, April 14th & 15th, 2018 to the Central City Lions Park located at 107 S. Morrison St. with scheduled performances on at 2:00 & 4:30 p.m. both days. SAVE MONEY by purchasing your tickets in advance at the following locations: Village Hall of Central City, IL, City Hall of Centralia-Water Billing Dept., Centralia Township in Centralia, IL, Rick’s Ace Hardware in Centralia, IL, and the Moran Queen-Boggs Funeral Home in Centralia, IL. Prices for advance tickets are $10.00 for adults and $7.00 for seniors (65 and over) and children ages 2 to 12, children under 2 are always free. On show day tickets will be $13.00 for adults and $8.00 for seniors/children.